A hot topic in modern palaeoart circles is the relationship between bone surface texture and soft-tissues. Specifically, artists are interested in what bone textures mean for skin composition and thickness, and whether it tells us anything about epidermal structures such as scales, feathers or hair. The idea that bone texture has a relationship to skin anatomy is not new, and palaeontologists have been linking details of fossil bones to beaks, horns, feathers and so on for many decades. Recent research on this matter is much more detailed and informed than previous efforts however, and uses careful comparisons of bone structure (both external and internal) in fossil and living species to make detailed predictions about the life appearance of long-extinct animals. 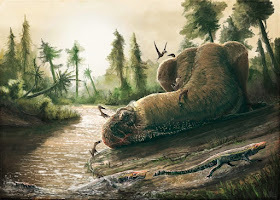 Tobin Hieronymus and other individuals from the Witmer Lab (University of Ohio) have made some especially valuable contributions to this field, and their work adds to a growing literature that palaeoartists should consult to make credible restorations of past species. Palaeoart is long past the stage where we can doodle a rough outline around a skeleton and call it a day - more than ever, production of truly credible palaeoartwork is only possible after careful and thorough research. One of the most interesting aspects of this recent work concerns a skin type that we rarely discuss for ancient animals: dense, stiff dermal tissues that forms thick armour in animals like hippos, mouse deer and pigs; and epidermal projections, such as horns and crests, in rhinos and birds. We might assume that these soft-tissue structures would leave little trace on bone and that we're ignorant of their presence in fossil animals until specimens preserving soft-tissues show us otherwise. However, this is not so. Work by Hieronymus (2009) and Hieronymus et al. (2006, 2009) shows that we can identify the presence of skin armour and epidermal projections without soft-tissue preservation. 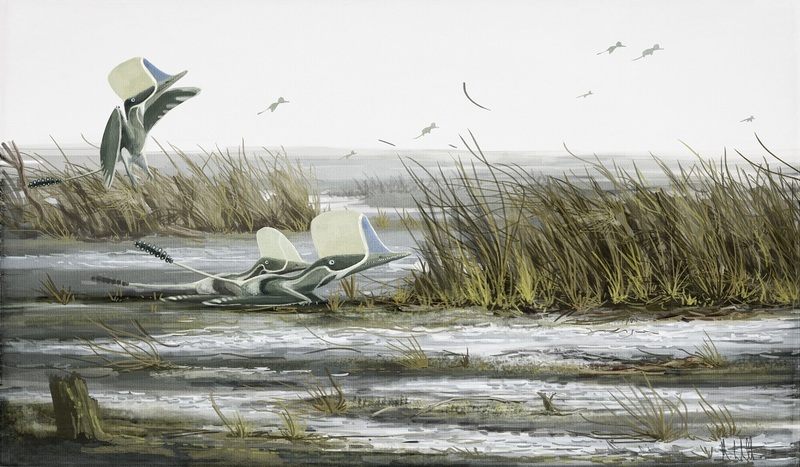 This has significant implications for how we might restore fossil animals, and artists should be on the lookout for features evidencing these structures when researching their reconstructions. Before we get to the fossil examples, it will help to know how skin is armoured and epidermal projections are reinforced without the aid of bony material. 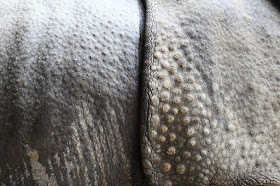 For armoured skin, white rhinoceros hide provides a well-studied example. Here, the dermis is reinforced with densely packed collagen fibres criss-crossing one another in three perpendicular planes (Shadwick et al. 1992). This structure differs markedly from typical reptilian and mammalian skin (Hieronymus et al. 2010) and has correspondingly different skin mechanics. Not only is it considerably stiffer and highly resistant to tearing, but under compression it is stronger than cartilage (Shadwick 1992). White rhinoceros skin is, on average, 25 mm thick (though their belly skin is about half that measurement) and it serves them well at resisting damage during intraspecific bouts or when on the wrong end of a predatory act. Similar skin has convergently evolved in pigs, hippos, mouse deer and seals, these being species that engage in biting and stabbing fights and having obvious need for protective tissues. Indian rhinoceros skin in all it's supercollagenous glory. Note the thick folding but otherwise sparse wrinkling, a consequence of poor elasticity in this skin type. From Wikimedia user Sanjay ach, CC BY-SA 3.0. Soft-tissue crests, horns and other projecting structures can also be made of expanded, dense dermis (seen in comb ducks), or reflect enhancement of another skin tissue: the epidermis (Hieronymus et al. 2006, 2009). These epidermal elements anchor to underlying dermis and are formed of dense keratin matrices, producing ultra-tough cornified tissue not dissimilar in composition to beaks, claws, horn sheaths or baleen (Hieronymus et al. 2006). Some skin projections can incorporate non-keratinised components as well - rhino horns, for instance, have mineral and melanin components as additional stiffening agents (Hieronymus et al. 2006) - and the degree of keratinisation can vary, depending on the functional demands of the projection. The crests of white pelicans are a well-known example of these structures, and are noteworthy for their ephemeral nature. 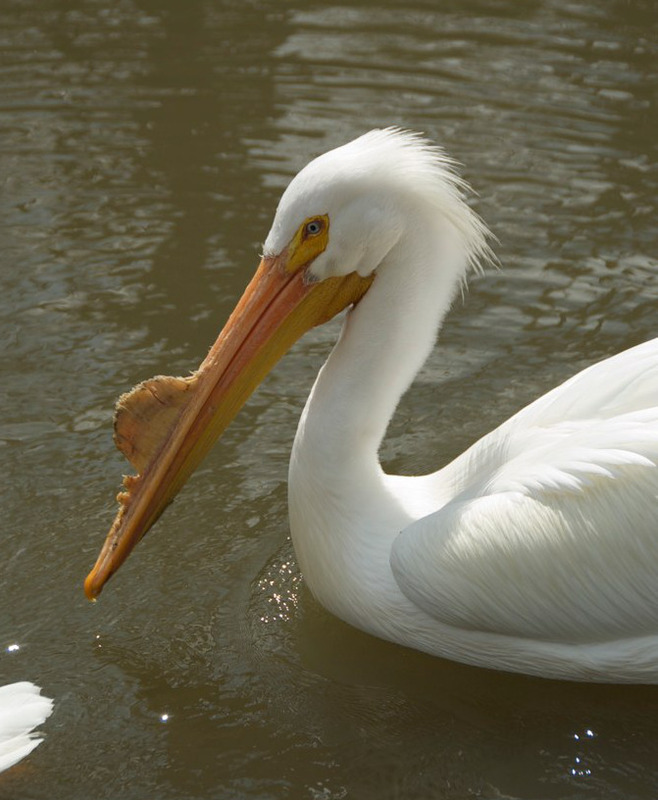 Unlike most epidermal outgrowths, pelicans shed and regrow these structures annually. That's food for thought for not only palaeoartists, but also those of us wondering if soft-tissue crests have significance to taxonomy. Would a fossil pelican with a rostral crest be considered a different species to one without? Quite possibly. American white pelican with rostral crest, photographed by Travis Barfield. Photo from Wikimedia. When either of these skin types overgrow bone, they leave clear traces on the bone surface texture and histology. The best places to look for these markers are animal skulls, as they are generally not separated from skin by layers of muscle and fat like postcranial bones, and they tend to be body parts that animals adorn with horns, crests and other epidermal outgrowths. Particularly good sites to check for skin-derived markers are the bones forming the cheek, those around the orbit, and along the forehead and snout, as these regions generally have the closest relationship between bone and skin. Collagen-dense armoured dermis leaves relatively coarse (1-2 mm) rugose projections of bone beneath it, often of sufficient extent that they are discernible in photographs. You can readily see them on rhino skulls, for instance, as well as around the jaw tips of hippos and the rostral bosses of red river hogs. They have a corresponding histological signature, too: patches of obliquely-orientated metaplastically ossified dermal collagen fibres (Hieronymus 2009; Hieronymus et al. 2009). These patches of rugose bone cover large areas of the skull, and, in hippos, they even wrap into the mouth, betraying the presence of soft-tissue armour inside the jaws. This is something for palaeoartists to note as it shows dense, armoured skin can grow around complex structures, like gums and teeth, and also allows for lip-like structures that sheath teeth (so no, these tissues are not excuses for toothy prehistoric artwork). I assume the stiffness of armoured skin explains why the 'canine pocket' in the hippo upper jaw does not collapse when gaping, despite their lack of skeletal reinforcement. Business end of a hippopotomus skull - note the rugose textures around the end of the snout, characteristic of collagen-dense armoured skin. Cropped detail from a CC BY-SA 3.0 photo by Wikimedia user ContinentalEurope. From Wikimedia. Similarly coarse rugose projections or spicules exist underneath epidermally-derived horns and crests, but with an important distinction to those underlying armoured skin. Rather than leaving uniform patches, these structures leave ring-like rugosities that outline the circumference of the projecting structure. This is true for massive projections, like rhino horns, and also more delicate ones, like pelican crests (Hieronymus 2009; Hieronymus et al. 2009). It's thought that stresses inflicted on projecting structures explain their ring-shaped 'footprint'. Virtually any load placed on a crest or horn is transmitted to base of the opposing side, meaning the edges of these structures experience the greatest loading in life. It makes sense, therefore, that the outline of the structures have the deepest developmental scarring (Hieronymus 2009). A boss or other elevated bony region is sometimes associated with epidermal structures too, but this is not universal. Ring rugosities do not tell us much about the exact morphology of projecting structures but they do reveal something about the extent of the base and - from the size of the rugosities and spicules - we can predict the size of the compositional fibres. If we assume that bigger structures need larger fibres for reinforcement, which seems borne out in modern animals - rugosity dimensions might give us some clue of overall structure size (Hieronymus 2009). Where can we find these structures in the fossil record? Turning our attention to extinct creatures, these bony correlates are robust enough to withstand fossilisation and we can look for hints of thick, armoured skin or epidermal projections in any specimen with reasonable preservation. The skulls of fossil rhinocerotids are an obvious place to seek such structures and the results are quite fascinating. Evidence of dense, armoured skin appears in taxa from c. 40 million years ago, while their horns are a more recent development, from about 20 million years ago (Hieronymus 2009). The development of large tusks, rather than horns, seems to have spurred the development of skin armour in ancient, hornless rhinos, and we can note parallel correlations between large teeth and armoured skin in other lineages. When animals are routinely slashing, ripping and biting one another, armoured skin seems to be a common adaptive response (Hieronymus 2009). 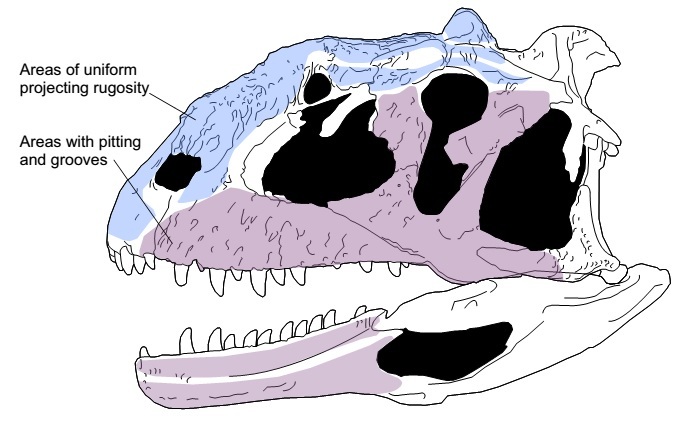 Majungasaurus crenatissimus skull, showing extent of bone texture related to armoured skin (blue) and tough cornified skin (purple). Skull drawn from Sampson and Witmer (2007); distribution of bone textures after Hieronymus (2009). It's not just mammals that get in on this act. The top and front of the skull of the abelisaurid theropod, Majungasaurus crenatissimus, matches osteological and histological criteria for dermal armour, and this is good reason to restore this species with thick, collagen-reinforced skin over its snout and braincase region (Hieronymus 2009). Adjacent skull areas - the sides of the jaws, the roof of the mouth, the orbital and cheek regions - also show hints of a gnarly skin covering, these being marked with a bone texture characterised by deep pits and grooves. Among modern animals, this seems best correlated with thick, highly keratinised skin, such as cornified pads or beaks (Heironymus 2009; Hieronymus et al. 2009). When considered with the correlate for dermal armour, these textures suggest the face and oral cavity of Majungasaurus was covered in deep, reinforced skin tissue, and we have to wonder how much of the underlying skull structure was obvious in life. Abelisaurids are well known for their gnarly, pitted skull bones (e.g. Sereno et al. 2004), and it's likely that thick facial skin occurred in other members of the group (Hieronymus 2009). These are animals that science encourages artistic speculation with: what would the armoured face of an abelisaur look like? I've taken a punt at this concept with the Kryptops painting accompanying this post, but I'm sure there are other configurations that could be explored. It would be remiss not to mention that armoured skin on theropod faces aligns well with face-biting antagonistic behaviour predicted from their pathological bones (Tanke and Currie 1998; Hieronymus 2009), and that this again chimes with biting behaviour driving evolution of armoured skin. Evidence of epidermal structures are common in a paleaoart mainstay: pterosaurs. By now, most of us will be familiar with the idea that many pterosaurs had soft-tissue headcrests thanks to well-publicised exceptionally preserved fossils (e.g. Bennett 2002; Frey et al. 2003), but can we predict them in species represented by bones alone? Thanks to bone textures, we can. Soft-tissue crests grow over low bars of bone projecting from pterosaur snouts, often with expanded anterior regions (Bennett 2002). Fine, curving striations and spicules are discernible on the top of these projections, contrasting with the smooth bone forming the base of the bony crest and the rest of the pterosaur skull. These rugosities mostly project vertically, or somewhat anteriorly at the front of the base structure. It is difficult to know if these rugose regions have a ring-like distribution given the flattened nature of most pterosaur fossils, but their presence around the top of a projecting bone bar implies a ring-distribution. Collectively, these components meet predictions for epidermal projections and their distribution points to a tall, narrow structure - a crest - rather than a horn or boss. We would likely see this as the most parsimonious take on pterosaur crest bases even without exceptional fossil preservation so, wherever you see these features on pterosaur skulls, it is reasonable to assume a large, prominent crest. I stress that you do not these features in all crested pterosaurs: some bony crests are completely smooth, and have no evidence for extensive soft-tissue elaboration. This is mainly seen in the ornithocheiroids (the group that includes taxa like Anhanguera, Pteranodon and Nyctosaurus). Darwinopterus robustodens as a case study for pterosaur striated crests, and what they mean for soft-tissues. Yes, they were that daft - don't feel you need to be conservative when restoring them! We are fortunate to have pterosaur specimens with preserved soft-tissues to help us gauge the size and shape of their crests. They are generally rounded, with the deepest portion posteriorly, and their size seems correlated with bony crest development (coarser rugosities and taller crests seem to indicate larger crests). Their crests were generally large, even in animals with modestly developed bony supports (Czerkas and Ji 2002), and they can grow to many times the area of the skull in species with strongly developed crest rugosities (Campos and Kellner 1997; Frey et al. 2003). Don't hold back when drawing these things, chaps: they were nuts (see diagram, above). There are surely other animals that we could discuss with these features, but I think our point is made by now: with careful observation and comparison to modern species, we can detect the presence of body profile-altering skin structures in fossil animals, and these features should be on the radar of anyone trying to restore fossil tetrapods credibly. It should be stressed how phylogenetically widespread the examples given in this post are: as if it needs saying - pterosaurs, rhinos, abelisaurids, deer and so on are not closely related, and yet they share basic aspects of bone texture and histology related to skin structure. The take-home here is that skin is a highly plastic, adaptable tissue that we need to be especially open-minded about reconstructing. It is naive to assume fossil animals will only have skin types common to their closest extant relatives. There are some caveats and pitfalls to be aware of about predicting tough dermis and epidermal projections. For example, there are a few cases where skin elaborations lack osteological correlates. Warthog warts, for instance, are prominent, permanent and conspicuous skin structures, but they leave no trace on the underlying bone. Likewise, the presence of armoured skin becomes difficult to predict beyond the skull because postcranial bones tend to be buried under other soft-tissues. We know from living animals that collagen-dense skin can be regionalised (mouse deer, for instance, tend to localise it on their dorsum and rumps - Dubost and Terrade 1970), so evidence of cranial armour is only a partial indicator for armouring across the body. Cuspicephalus scarfi regrets sporting a hunk of tall, cornified cranial epidermis on a windy day. Detection of bone rugosity type is also an issue, at least in cases where we are unable to see fossil material first-hand. Yes, the rugosities and structures discussed here can be seen in photos, but not always. Moreover, unless the photo is especially clear, it's easy to confuse them with other types of bone surface rugosity, of which there are several, all with different soft-tissue correlates (Hieronymus et al. 2009). So, before going nuts with armour, crests and horns on a fossil animal because they seem to have a rough surface somewhere on their skull, check out specimen descriptions, high-res photos, histological studies, quiz those consultants, and make sure the criteria for these elaborate skin structures are met. That final point seems particularly relevant given the modern palaeoart fashion of speculating about fossil animal appearance. Long-time readers will know that I'm an advocate of this practise, but science of the kind discussed here puts an onus on artists to be careful when adorning extinct animals with elaborate skin structures. 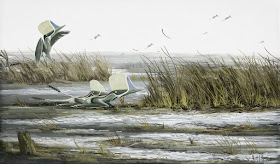 Yes, there are loopholes which can justify these outlandish reconstructions if we want to find them, but consider that some speculative structures included in modern palaeoartworks would be expected to leave osseous markers if they were present. Maybe this is a case where absence of evidence is actually evidence of absence and, if we cannot find these correlates, we should assume those structures were not present in our subject species. Enjoy monthly insights into palaeoart and fossil animal biology? Consider supporting this blog with a monthly micropayment, see bonus content, and get free stuff! Bennett, S. C. (2002). Soft tissue preservation of the cranial crest of the pterosaur Germanodactylus from Solnhofen. Journal of Vertebrate Paleontology, 22, 43-48. Campos, D.A. & Kellner, A.W.A. (1997). Short note on the first occurrence of Tapejaridae in the Crato Member (Aptian), Santana Formation, Araripe Basin, Northeast Brazil. Anais da Academia Brasileira Ciências, 69, 83–87. Czerkas, S. A., & Ji, Q. I. A. N. G. (2002). A new rhamphorhynchoid with a headcrest and complex integumentary structures. Feathered Dinosaurs and the Origin of Flight, 1, 15-41. Dubost, G., & Terrade, R. (1970). La transformation de la peau des Tragulidae en bouclier protecteur. 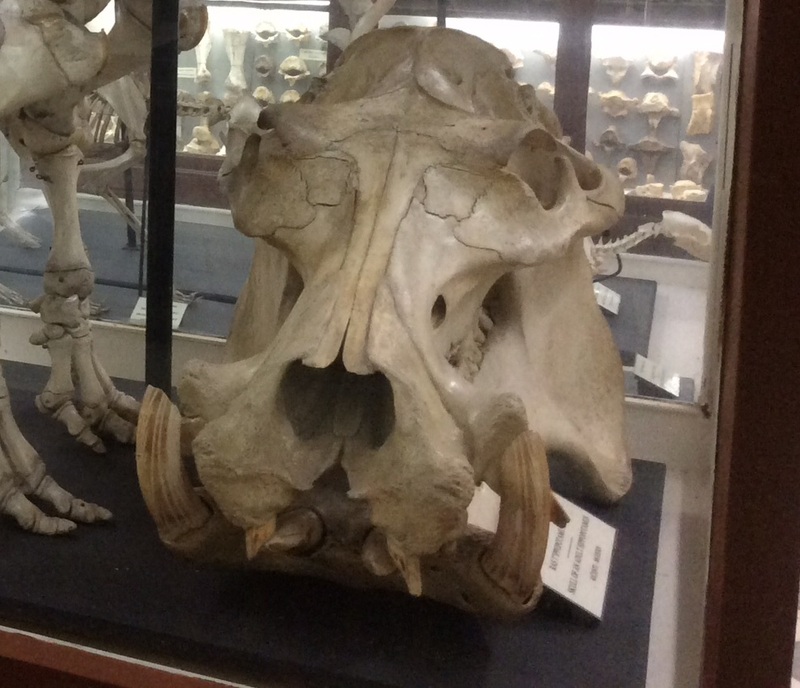 Mammalia, 34, 505-513.Frey, E., Tischlinger, H., Buchy, M. C., & Martill, D. M. (2003). New specimens of Pterosauria (Reptilia) with soft parts with implications for pterosaurian anatomy and locomotion. Geological Society, London, Special Publications, 217, 233-266. Hieronymus, T. L. (2009). Osteological Correlates of Cephalic Skin Structures in Amniota: Documenting the Evolution of Display and Feeding Structures with Fossil Data (Doctoral dissertation, Ohio University). Hieronymus, T. L., Witmer, L. M., & Ridgely, R. C. (2006). Structure of white rhinoceros (Ceratotherium simum) horn investigated by X‐ray computed tomography and histology with implications for growth and external form. Journal of Morphology, 267, 1172-1176. Hieronymus, T. L., Witmer, L. M., Tanke, D. H., & Currie, P. J. (2009). The facial integument of centrosaurine ceratopsids: morphological and histological correlates of novel skin structures. The Anatomical Record, 292, 1370-1396. Sampson, S. D., & Witmer, L. M. (2007). Craniofacial anatomy of Majungasaurus crenatissimus (Theropoda: Abelisauridae) from the late Cretaceous of Madagascar. Journal of Vertebrate Paleontology, 27, 32-102. Sereno, P. C., Wilson, J. A., & Conrad, J. L. (2004). 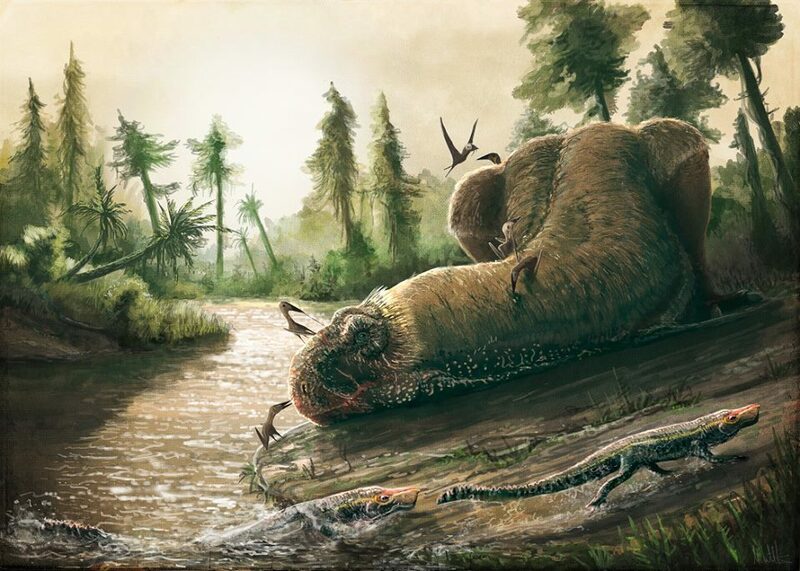 New dinosaurs link southern landmasses in the Mid–Cretaceous. Proceedings of the Royal Society of London B: Biological Sciences, 271, 1325-1330. Shadwick, R. E., Russell, A. P., & Lauff, R. F. (1992). The structure and mechanical design of rhinoceros dermal armour. Philosophical Transactions of the Royal Society of London B: Biological Sciences, 337, 419-428. Tanke, D. H., & Currie, P. J. (1998). Head-biting behavior in theropod dinosaurs: paleopathological evidence. Gaia, 15, 167-184. Speaking of rugose textures in theropods, I have been looking lately, and it seems several groups exhibit rugosity on their skulls. For example, Carcharodontosaurus seems to have some rugosity going on with its maxilla since it shows lots of lines, ridges and pores. Tyrannosaurs also seem to have some leaf shaped impressions on their maxilla, maybe suggesting something with the skin texture overlying them. The video belows also explains some interesting things. I can also point out that Monolophosaurus seems to have patches of rugosity on its crest and head suggesting something odd going on. These are just some things I wanted to share with you, and let me know your thoughts. I'm not an expert in theropod skulls so I don't want to say something I'll regret later, but what I've seen of the maxillae in these animals seems most consistent with scales or tough, cornified skin. We should predict variation in these animals, of course: their bone textures are noticeably different, and there's a strong chance that reflects differing skin tissues. "A boss or other elevated bony region is sometimes associated with epidermal structures too, but this is not universal." My mind immediately jumped to Pachyrhinosaurus when I read this. Are you agnostic with regard to the suggestion that the boss supported a keratinous horn? There's been dedicated study into this issue using bone texture (Hieronymus et al. 2009, http://www.ohio.edu/people/witmerl/Downloads/2009_Hieronymus_et_al._Pachyrhinosaurus_skin.pdf). 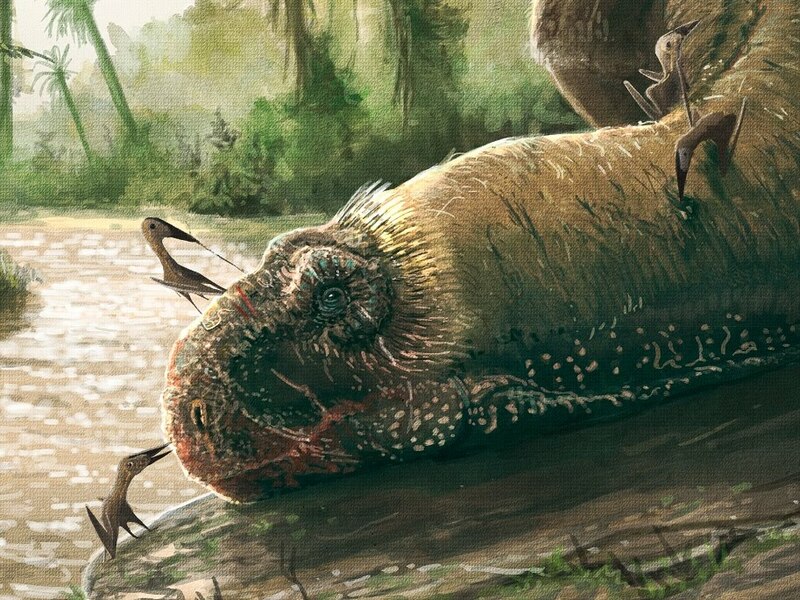 The finding seems to be that it was covered in tough keratin - the same tissue that covered ceratopsid horns - but that it formed a tough pad, not a projecting horn-like structure. That seems reasonable to me. The facial tissue of Pachyrhinosaurus has been investigated in detail, and there's no trace of armoured skin. That said, there are plenty of scales and thick, cornified epidermis over the nasal boss, so it was probably pretty tough all the same. I meant along the side of it's body (ribcage) not the side of it's face, sorry for not mentioning that. What's your take on the texture described as "hummocky" in Carr's Daspletosaurus horneri paper^1? I note they also cite the Hieronymus 2009 paper but they conclude "flat scales". I must admit to having issues with this study - not necessarily the conclusions (although there are issues with the idea of 'crocodile-like face scales', given that crocs don't have facial scales! ), but the fact that the maxilla was not photographed or figured in a way that we can make an assessment ourselves. There are some hummocky tyrannosaur maxillae out there (which would be consistent with scales) but this study does not present any means for us to determine that. They might be right, but it's not good science to be correct without showing how. Also, it would be useful to look at these specimens histologically as well as externally. Surface texture is only half the story. We have a lot of tyrannosaur skull material, hopefully someone will/has already chopped one up so we can check for dermal correlates in the bone, too. Really nice write-up! I find it especially interesting with what you note about rhino integument and how it predates the evolution of horns in the group. Being rather dinosaur-centric, I couldn't help but wonder if this was the case in ceratopsians, but by the looks of it it isn't. From what's been published ceratopsian skin impressions are rather typical in comparison to other dinosaurs: Centrosaurus, Pachyrhinosaurus, and Psittacosaurus all have fairly small polygonal scales like hadrosaurs. Armored skin only appears in Triceratops, which is almost armored like a tank and has been suggested to have a keratinous armored face. It's rather interesting that while in rhinos and many mammals groups armor predates the evolution of horns, ceratopsians seem to get well into the evolution of horns and beaks and only one of the most derived members has evidence of armored skin. Perhaps something different about their behavior and ecology? The argument that "lips would collapse in on themselves" is a bit of a misnomer. What people don't take into account is that the lips and "pockets" are three dimensional convex structures. If you take a flat piece of fabric and form a half-bowl shape with multiple points of contact around the perimeter you can see that the normally floppy material holds its shape without collapsing. That is due to the nature of convex forms. By taking a sheet material normally thin and flexible and introducing folding and bending the material can better hold its form. In addition, as you mentioned above the skin was probably thick enough to hold the form and if you look in the mouth of the hippo there is lots of tissue around the pocket for those long tusks. Another thought I had was, how unlikely it might be for the "lips" to be both cornified along the tooth row and completely cover the teeth. I imagine having rigid skin covering the teeth would render them useless as the skin wouldn't flex up to allow the teeth to be brought to bear during a bite. I don't have a real opinion on whether these animals had lips or not and it is a fun bit of discourse to keep up with. I could do with a little less uncertainty with regards to lips, but at least it gives us room to play a little. Interestingly, the thorny devil lizard (Moloch) has little indication that it's head is that spiky just from the texture of its skull (http://digimorph.org/specimens/Moloch_horridus/whole/). Some bosses, but not nearly as much as the actual head with flesh on it. And (correct me if I'm wrong) various soft tissues (like wattles) don't seem to show osteological correlates.